A mix of rockin', swingin' Chicago/Texas Blues, with vocals harmonica, guitar and organ. 2. Have You Been Cheatin' On Me ? Born in 1965 in Newport, Vermont into a musical family with an English mother and a French-Canadian father, Mike Goudreau picked up his first guitar at age 14 and hasn't stopped playing since. His early influences included the Beatles, Chuck Berry, Ricky Skaggs, Johnny Cash, Nat King Cole, Louis Armstrong, Frank Sinatra, and later, Albert King, Freddie King, Stevie Ray Vaughan, Powder Blues and Downchild - to name a few. Such diverse interests help to explain why Mike is confortable in so many musical genres, especially jazz and blues. In the early 90s Mike formed the Boppin Blues Band. Taking its name (and some of its style) from Vancouver's Powder Blues Band, the BBB blew into the Canadian music scene in 1994 with an independently CD - Sold Out - with 10 songs running the gamut from solid Chicago blues to jazz influenced 40s & 50s swing/jump/shuffle and a few country and gospel tunes thrown in for good measure. It showcases superb guitar work and vocals from Mike with a great back line of drums, bass, piano, horns and harp. Upon hearing it, Andy 'Blues Boy" Grigg of Real Blues Magazine called them one of the most talented bands in Canada. I Dig My Job (1996) featured mostly original tunes including a couple en français, which was unique. Real Blues Magazine continued its love affair with the band rating it as one of the 5 best blues CDs in Canada that year and named them as Best Group in Eastern Canada for 1996-97. They were also nominated as Best New Artist at Canada's Maple Blues Awards in 1997. A California radio station (KKUP FM) placed I Dig My Job in the Top 25 Blues CDs for that year! Happy Go Lucky appeared in 1999 with 9 of 13 songs originals. More accolades: Real Blues Magazine called it one of the 5 best CDs of the Year and named the Boppin Blues Band as Best Swing Band and Best Unsigned Band in Canada. It was also nominated by Maple Blues for Best Album. The following year Mike indulged his passion for his other favorite musical genre - jazz - when he released Stardust Memories (2000), a compilation of 14 classics including Route 66, The Lady is a Tramp, and Don't Get Around Much Anymore. In 2001 Mike received a Research and Creation Grant from the Quebec Arts Council and produced Nous avions rendez-vous on the Montreal based Bros label ... 12 original blues tunes all in French! They were invited to the " Francofolies " in Montreal as well as a live recording captured by CBC's " Silence On Jazz " broadcast coast to coast. In 2002 he recorded Thank You Louis, a tribute to the great Louis Armstrong. It was, and still is, very popular in Quebec garnering him numerous interviews with Radio-Canada, CBC Radio/TV and sell-out live shows. My Favorite Time of the Year (2004), is a nice, personalized collection of original and classic Christmas tunes. Over the past decade Mike has performed at some of the most prestigious Jazz & Blues Festivals in Eastern Canada including a record number 6 appearances at the Montreal Jazz Festival, 4 times at the Tremblant International Festival de Blues, 6 appearances at the Edmundston Jazz and Blues Festival, Quebec City, Sherbrooke, Granby, Magog, Joliette, Jonquiere, Trois Rivieres, Rimouski, Riviere du Loup, Maximum Blues de Carleton, Fredericton's Harvest Jazz & Blues Festival, Saint John Jazz Festival and Festival by the Sea, among others. When asked why he plays both jazz and blues Mike replies: "I get bored doing just one type of music. I love jazz for its beautiful melodies, chords, and improvisation. I love blues for its energy, soul and milking its three-chord structure. I enjoy playing rock 'n roll too. But no matter what music I play it has to SWING!" 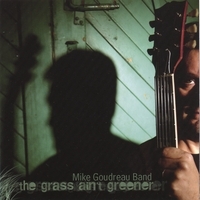 With the newest CD, The Grass Ain't Greener (2006), Mike has moved away from the big band style that characterized the Boppin Blues Band. The Mike Goudreau Band has stripped down to guitar, drums, bass, keyboards and some great wailing harp and slide guitar from Harmonica Zeke. You get a great mix of rockin, swingin, up-tempo blues - 8 of the 12 songs are originals!! Excellant blues music. I like!